This ring force gauge allows determining axial and bearing forces and then depicting them via a display device. The display instrument of the ring force gauge is an exact and large dimensioned measuring clock that is scaled with kN. The ring force gauge is not only a measuring instrument but also a measuring gadget to conduct a wave. This model series stands out particularly due to a large measuring clock, as mentioned before, that can immediately receive the determined value from the force transducer and then instantly display it. Furthermore the measuring clock of the ring force meter is equipped with a zero correction. There are different models of the ring force gauge purchasable that can be split further due to the measuring value that is overriding. Depending on these models and on their different nominal loads, there arise various measuring ranges lying between 0 N and 1,000,000 N (or 1 kN). 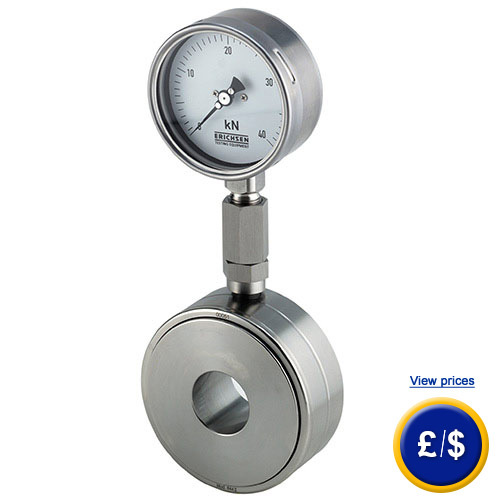 The ring force gauge is made of stainless steel, making it a robust measuring device applicable under various conditions, whether it is dry or humid conditions. We also have other devices in our assortment that allow performing temporary or permanent measurements on machines, constructions and systems. Here you can see an overview of all force gauges. For further information about the ring force gauge of the 844 series, please read the following technical data or call our Hotline: UK customers +44(0) 23 809 870 30 / US customers +1-410-387-7703. You can also reach us by using our contact form. 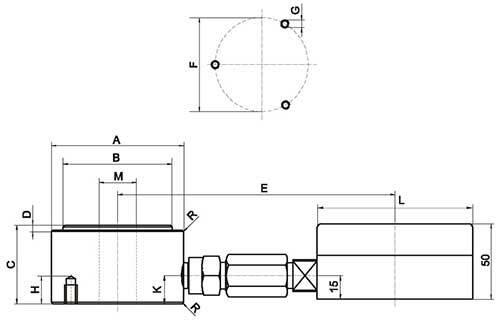 Our engineers and technicians will gladly advise you regarding the ring force gauge of the 844 series or any product in areas of measuring instruments, regulation and control or scales and balances. Here to see is the ring force gauge 844 with its dimensions.